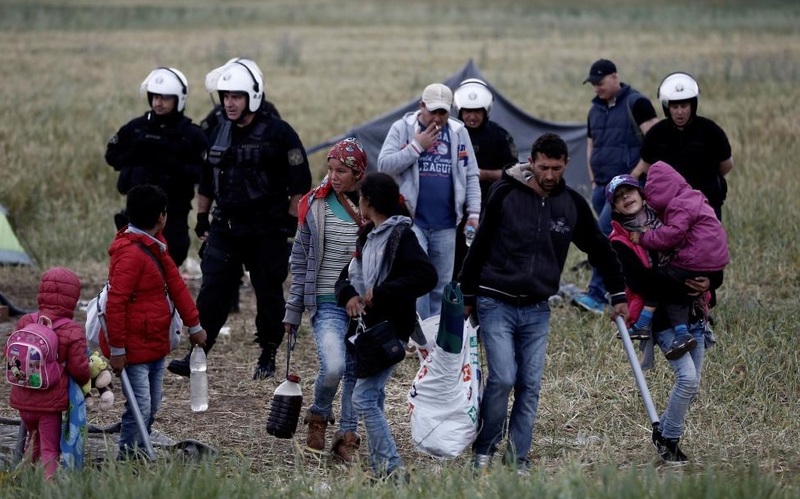 Greek police, most of them in riot gear, moved in on the refugee camp at Idomeni on the Greek-Macedonia border where an estimated 14,000 people lived in squalid conditions. As bulldozers razed the camp, police escorted refugees to buses to take them to “organized refugee centers.” This photo is a family being evicted by the police operation. 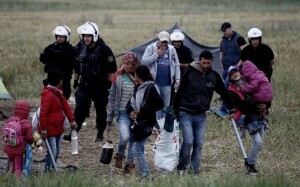 Media reported that organized refugee center thing like it was the gospel truth when Greek refugee centers are notorious for being more like concentration camps without sufficient food & water, lacking sanitation, forcing refugees to stay put without right of movement. They are so bad that Doctors Without Borders (MSF) actually withdrew from them saying they wanted no part of such barbaric treatment of refugees. That would explain why some refugees fled on foot rather than be herded on to the buses where they could just as well be deported to Turkey, as per the European Union agreement. According to media & more reputable sources like Doctors Without Borders, most of the forcible eviction went without incident. It was probably not difficult to persuade people to leave squalor, especially after their tents were mowed down. Immigration is a human right & one of the most urgent issues of our historic period. Open the damn borders. Oppose the wars & sweatshop economics that create refugees.